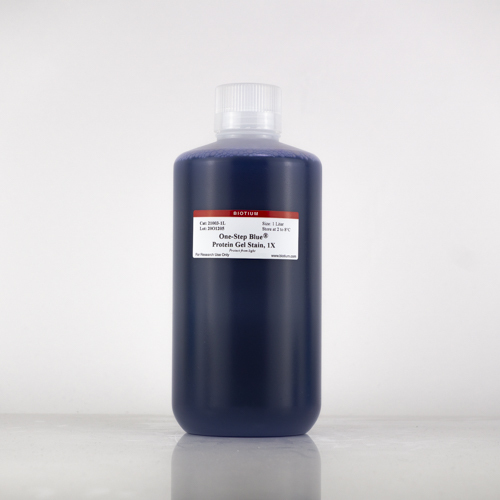 One-Step Blue® is a ready-to-use protein gel staining solution. It produces fast (5-60 min) protein staining in a single step without fixation or washing. Proteins can be detected by visible blue staining, or by near-infrared fluorescence. In addition to rapid results and simple staining, One-Step Blue® offers safer handling and disposal compared to Coomassie staining because it is entirely aqueous-based, without hazardous methanol or acetic acid. For more information, download the One-Step Stains Safety Report. One-Step Blue® has comparable sensitivity as the widely used Coomassie Blue, with a lower limit of detection around 10-20 ng depending on the detection method used. Note that staining intensity varies between proteins. The staining is fully compatible with mass spectrometry and Edman-based sequencing. Biotium also offers One-Step Lumitein™ Protein Gel Stain, a rapid, easy-to-use, non-toxic red fluorescent protein gel stain for detection using a UV transilluminator or laser gel scanner, that costs significantly less than other fluorescent protein gels stains. Email us to request a free sample! AccuOrange™ Protein Quantitation Kit is a highly sensitive fluorescence-based assay for quantitating purified protein samples in 96-well format (excitation/emission = 480/598 nm). The detection range of the assay is 0.1-15 ug/mL protein.